The man who took five firefighters hostage in his foreclosed-upon Georgia home has been killed by police. With one hostage released earlier in the ordeal, the remaining four are safe with minor wounds sustained in the SWAT team operation to free them. The gunman, who had barricaded the house, has been allegedly killed by a SWAT team trying to free the Gwinnett County firefighters. Police Cpl. Edwin Ritter told a press conference that authorities decided there was an imminent threat to the hostages’ lives and ordered the SWAT team to move in. The hostage-taker was apparently demanding that his electronic devices be switched back on, after running up debts. Ritter refused to release any details about the death of the suspect, whose body is still inside the house. Two ambulances that left the scene were carrying a wounded police officer and the firefighters who were slightly injured by a distractive blast the SWAT team used upon entering the house. Several gunshots were heard after the blast as the suspect allegedly engaged in a firefight with the officers. Authorities told local media that the fire department was at the residence in response to a medical call. Fire department Captain Tommy Rutledge said the call the firefighters were responding to seemed routine, a kind “they respond to hundreds of times.” Rutledge refused to speculate on whether there was a real emergency at the home. Initially the suspect, who has not been identified, had taken five firefighters hostage but later released one so that he could move the fire truck away from the house. Ritter reported that the gunman was suffering from financial difficulties and demanded his power and cable be restored. Public records show that the house where the firefighters were being held is in foreclosure and had been bank-owned since November of 2012. "He wanted all those things turned back on," Ritter said. "That's why he was holding them hostage." Authorities asked media to "not cover anything" around the scene, as they were not sure whether the hostage-taker had access to news. "Several negotiators" flocked to the scene trying to get the remaining four firefighters out of the house, one local official told reporters. Before the news helicopters were forced to move away, video footage showed dozens of police and fire trucks surrounding the neighborhood. 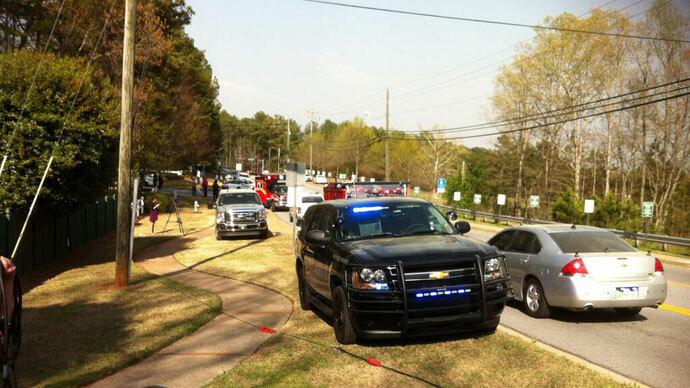 Ambulances were deployed to the area and Gwinnett County's district attorney arrived to the scene. "This is the result of his actions," Ritter said. "We didn't want it this way but he was calling the shots, and this was the end result."